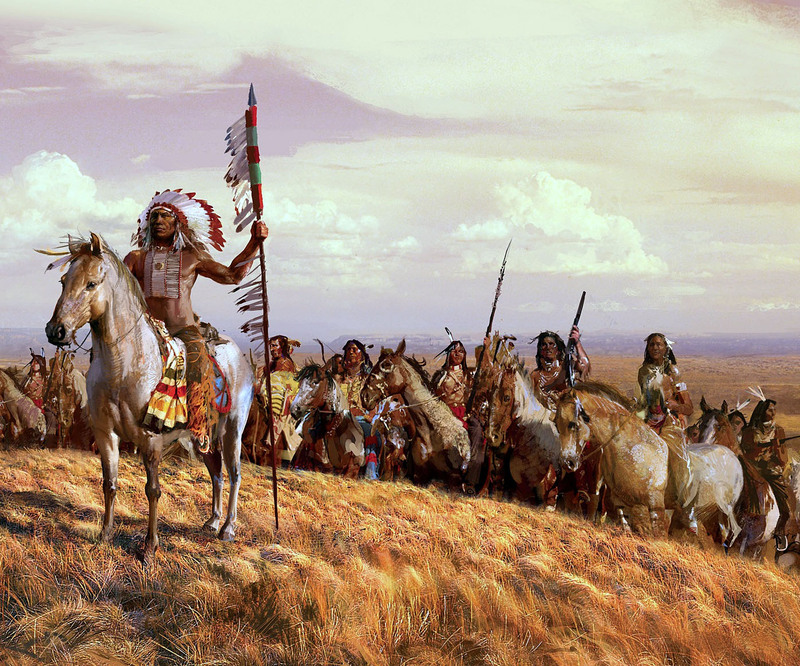 Comanches, Mohawks and Chippewa – Oh My! These days, most Amateur Radio gear is identified with nothing more interesting than simple alpha-numeric designations like a Kenwood TS-570, Icom IC-7410, or Elecraft K3, but the naming landscape was far more colorful and romantic back in the day. 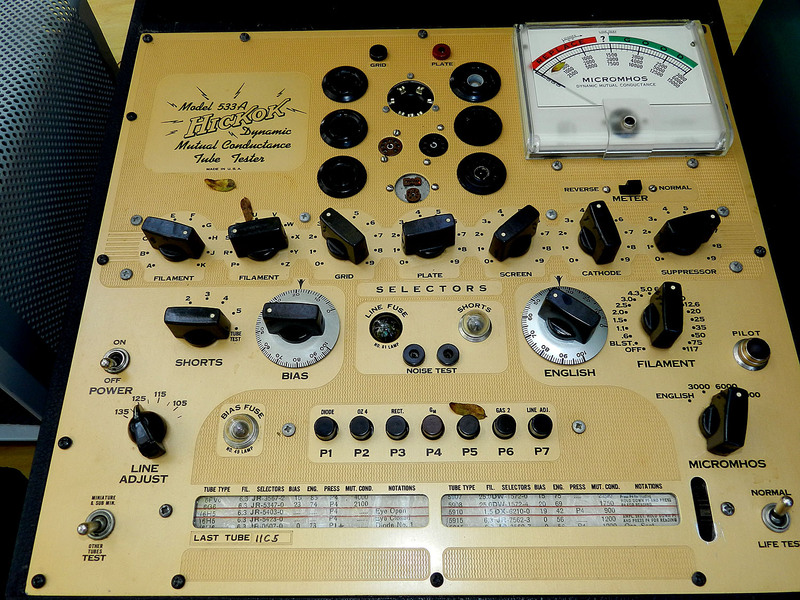 Heathkit, for example, chose to celebrate Native Americans with a variety of offerings for the Amateur market. 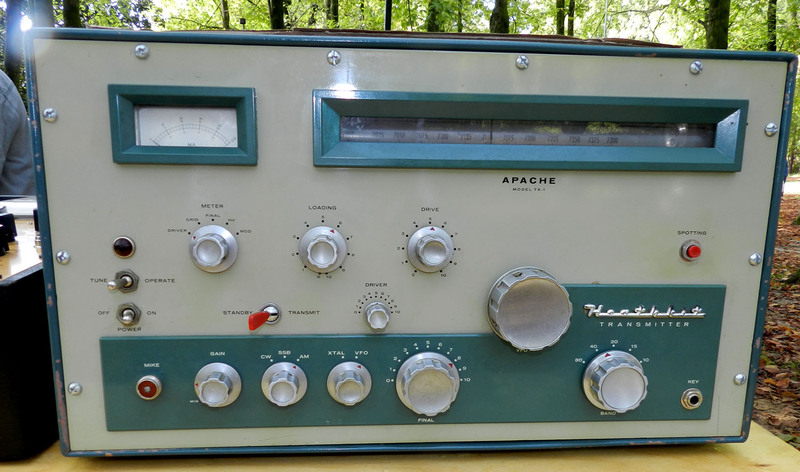 Among those were the Apache transmitter and matching Mohawk receiver, the Cheyenne transmitter with the companion Comanche receiver, and a nifty little general coverage receiver called the Mohican. And it didn’t stop there either. The Heathkit 6 Meter transmitter was named the Shawnee, and it’s rhyming 2 Meter cousin was the Pawnee. Continuing the theme were Heathkit Kilowatt amplifiers Warrior and Chippewa. And the VHF offering of the day was the Seneca. I have no clear explanation for the interesting Native American naming convention used by the former manufacturer from Benton Harbor, but I always enjoyed hearing those names on the air as a station would describe his rig. I was a youngster back then, and the mention of an Apache or Comanche always triggered thoughts of Roy and Trigger, or Hopalong and Gene, and a scene from a western would often play out while I vicariously rode the range while riding the airwaves. And Heath didn’t hold a monopoly on creative license back then either, not by a long shot. The Hallicrafters company made a short-lived line of high-powered transceivers which paid homage to the weather. These included the Cyclone, Tornado and Hurricane. The later of these may be the only 2 KW transceiver ever produced. The Clegg Company, out of New Jersey, was a big player in VHF gear throughout the 60s and chose names that were literally out of this world. Imagine hearing something like this on a 6 Meter roundtable during the day. “Your Thor 6 is really punching through today, Old Man, I’m running a brand new Venus here”. “Your turn, Bob, and let us know how we’re sounding on that new Interceptor receiver of yours”. No, I’m not making this up. And heaven knows what Clegg was thinking when they named their 6M/2M transceiver the Climaster Zeus. The E.F. Johnson Company is another that obviously had a host of wacky creative talent in the product naming division during the 50s and 60s. I had the pleasure of cutting my teeth in Amateur Radio on a Johnson Viking Adventurer. Other wonderfully named gear from this pioneering company included the Viking Invader, Viking Ranger, Viking Valiant, Viking Challenger and the Viking Pacemaker. Lafayette Radio had their Voyager transmitter, Swan Radio had the Astro and Cygnet transceivers, and Gonset offered the Commander, Communicator and Sidewinder to the Ham market. And no conversation about the nostalgic names of gear from yesteryear would be complete without including the many fabulous offerings from the Ten-Tec arsenal of Amateur products. The extensive Ten-Tec product line has included, or still includes, the Argonaut, Argosy, Century 21, Corsair, Delta, Eagle, Jupiter, Omni, Orion, Paragon, Pegasus, Rebel, Scout and Triton. And to their credit, Ten-Tec maintains a warm and friendly naming convention even to this day for many of their products, perhaps the sole practitioner of a practice that is quickly fading into the noise. I get it that all things change. Change, in fact, is the one great constant of our Universe. But I still have a warm spot in my heart for all the wonderful names of the past. And lucky for me these names aren’t lost to the historians either. All I have to do is crank out a CQ on 40 Meters most any evening, and then sit back and listen as the Apaches, Mohawks and Chippewas come back from the ether. The Helena, Alabama Hamfest, and something you don’t hear every day. This past weekend brought the fourth running of the Helena, Alabama Hamfest, held not far from the Birmingham metro area. It was my first opportunity to visit, and the abundant accolades I’d heard were understated. The large outdoor event was held a midst glorious sunshine and mild temperatures in the heavily wooded Helena Amphitheater, located in the center of one of Alabama’s most picturesque little towns. 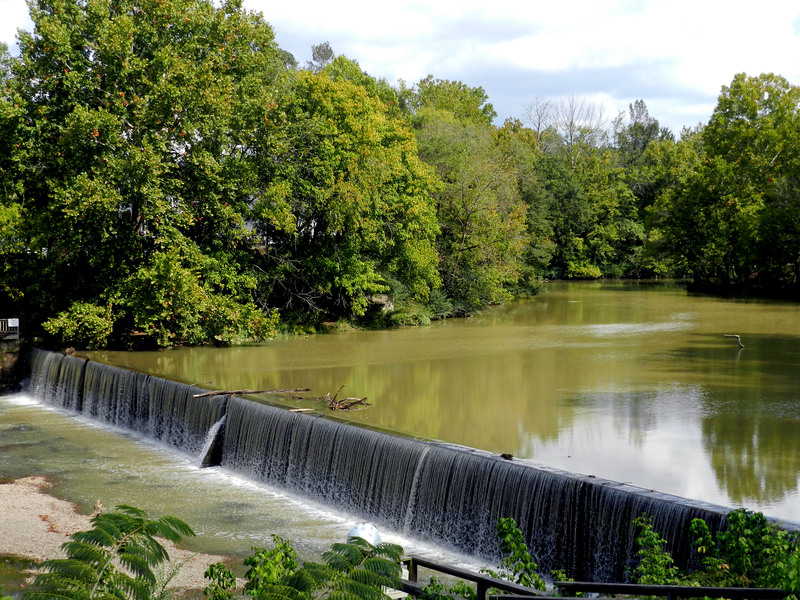 With thundering train tracks to the east and west, and the bucolic Buck Creek flowing swiftly alongside, the venue was inviting. And come they did too, as a large gathering of vendors exhibited their flotsam and jetsam. It was boneyard heaven. 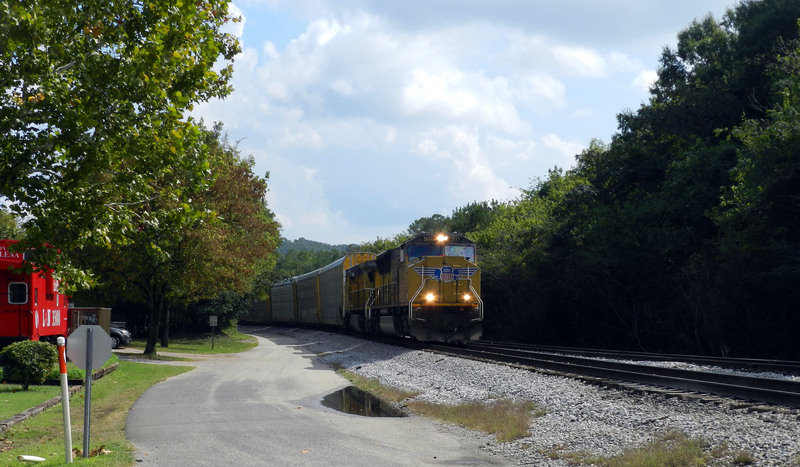 The Union Pacific roaring by. All the wonderful names from my childhood were there – Heathkit, Collins, Hammarlund, Johnson and more. And every vendor beamed with delight when asked about his beloved old gear. “Used this when I was a Novice”, one remembered fondly, and “She still works like the day I built her” another shared with obvious pride. Commerce was brisk, but mostly old friends gathered to share the love and camaraderie of their wonderful hobby. So much to see — where to begin? And so an enjoyable morning and early afternoon was spent with my brothers in RF, relishing the wonderful Alabama Autumn and thankful to be a part of the world’s greatest hobby. And there was something else that distinguished the Helena Hamfest from any other I’d ever attended. Every time the Master of Ceremonies made an announcement from the Amphitheater stage, he made sure he had our attention. 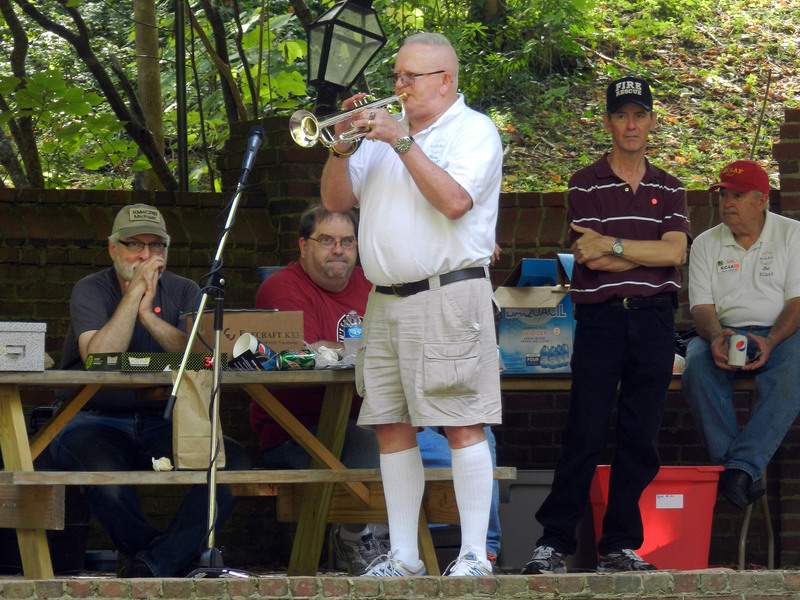 Preceding any announcement, Shelby County Amateur Radio Club President Eugene “Geno” Newman, N4GNO, brandished his bugle and lit into a rendition of Call To Post. I half expected to see a troop of Thoroughbreds and a tray of Mint Juleps each time those familiar notes echoed throughout the park. Very, very cool! Geno Newman, N4GNO, and Call To Post. And the Helena Hamfest was radio active in the truest sense of the word as well. An Amateur Radio station was on the air, working the Straight Key Century Club Weekend Sprint event, and showcasing the vitality of our hobby. 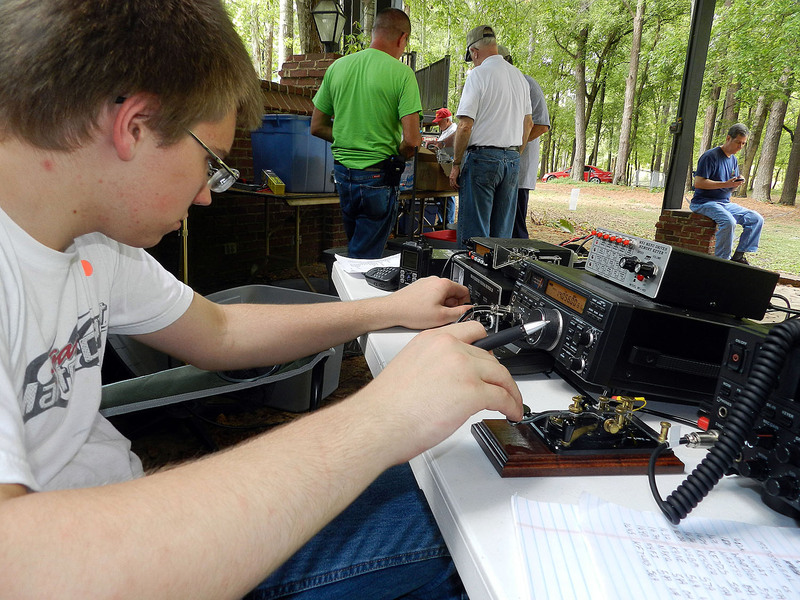 Manning a vintage J-38 hand key was 15 year-old Alabama Young Ham of the Year Daniel Smith, KV4LQ. No, I didn’t win the Elecraft KX3 which was awarded that day, but I left enriched none-the-less. 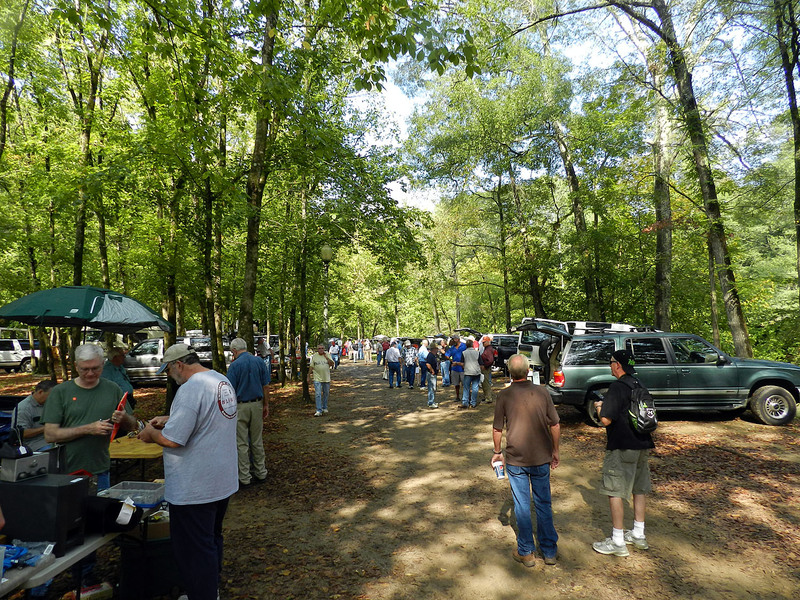 Old friendships rekindled, new acquaintances made, an incomparable Alabama Fall day, and Amateur Radio — It just doesn’t get any better than that! 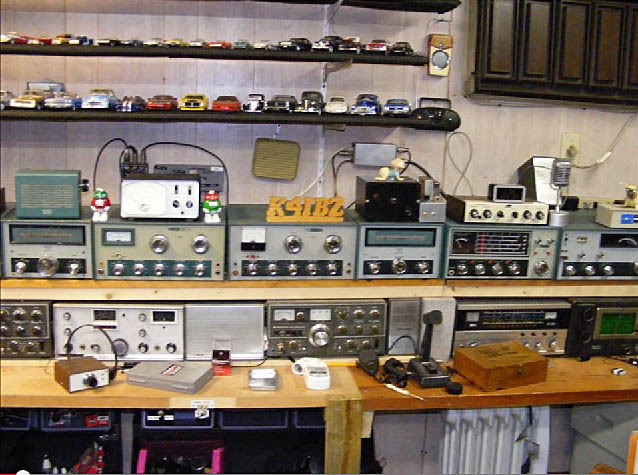 Is there any other hobby whose enthusiasts are more passionate than those of us in Amateur Radio? I think not … not even close. Just yesterday, a fellow I was chewing the fat with couldn’t wait to let me know that he was using a 95 year-old bug, while another proudly proclaimed he was sending with his original Novice key from back when Kennedy was president. Still another chap recently publicized the fact that he was transmitting with aluminum folding lawn chairs as his antenna. And then there’s John who hasn’t missed a daily QRP DX contact in several years, and Biz who programmed a robot to call CQ, and on and on it goes. And examples such as these are merely the tip of the proverbial iceberg when it comes to the depth of love and passion I hear manifest for our wonderful hobby every single day. Heck, If I didn’t know better, I’d think the conversation I hear swelling from my transceiver was made by giddy school children, rather than seasoned veterans. But then that’s the nature of our hobby, isn’t it? It transforms us all into wide-eyed evangelists, young at heart, filled with the wonder of radio, and compelled to share our joy. And so it was that a goodly portion of this joy spilled out one morning on 40 CW when I met Bill, K4IBZ. As I’ve written previously, I’m just naturally attracted to a good bug fist, and it was the sweet melody of K4IBZ’s CQ that drew me to him. I learned that Bill was in Crestview, Florida, just about midway between Defuniak Springs and Pensacola, and that he had been originally licensed at around the same time as I in the early 60’s. 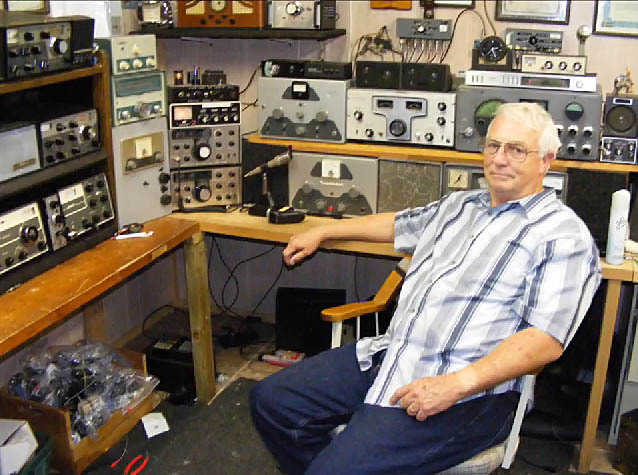 His station that morning was a pair of Kenwood Twins, but I soon discovered that he had over 40 working rigs in his shack. “And I use a different rig most every day”, he nonchalantly remarked. I let the thought percolate for a moment as the gravity of the comment settled on my shoulders. More than 40 working rigs in his shack, all ready to use? Who does that, I wondered? We’re all prone to moments of excess and exuberance, and I guess Bill just got a bit carried away with himself, I rationalized. He must be awfully gifted with old radio repair too, I imagined, able to recite the resister color code without even looking. And before I had completely digested the fact that this fellow had 39 more rigs than I, he proceeded to tell me about his key, and it wasn’t a bug after all. And somehow I knew Bill was as serious as an exploding transformer. If a guy uses a different complete station every day of the week, why should I be surprised he uses a key made from cutlery? I switched from the old Japanese bug I had been using during our QSO to my own Cootie, and proceeded to engage in a cootie-to-cootie contact with Bill, although with not quite the same finesse as Bill exhibited with his Beefeater. And like a venerable teacher patiently coaching his students, Bill suggested “you have too much stiffness with your hacksaw blade cootie, OM”, “The Beefeater will help with your spacing”. And for just a moment I wondered what a non-ham might think of the language Bill and I so casually tossed about. Cooties? Wasn’t that something the unpopular kids had in grade school? And isn’t Beefeater a type of gin? A different rig every day? And homebrew too? And as Bill and I finished what was the first of several contacts to come, he invited me to Google K4IBZ for his YouTube video. And I learned that complete plans for Bill’s Beefeater are available for download too. And so I have a Beefeater on my to-do list now, with plans to visit the local dollar store soon for supplies. Believe you me, I know better than to use one of our regular steak knives for the project though. My sweet XYL is incredibly tolerant of my Amateur Radio hobby, but I’m not about to rock the boat. You see, we have a deal. She doesn’t disturb my keys and I promise not to steal any cutlery. And now, the rest of the story!